The art work now hangs on one of the walls of National Gallery of Modern Art, where an exhibition displaying the indigenous culture of Australia is bring presented. NEW DELHI: Was it a mere coincidence or was the universe making a deliberate point when the angry storm struck Delhi on the same day the aboriginal art consignment from Australia was being received. Inside one of the large, securely sealed boxes, lay the art work called Wandjina, the cloud and rain spirit according to Australian aboriginal mythology. Right when the forked lighting struck ground, Wandjina emerged. Maybe it meant nothing, or perhaps, much more than our scientific temperaments can comprehend. Whatever it was, the rain Gods seemed to have given it a thunderous welcome. The art work now hangs on one of the walls of National Gallery of Modern Art, where an exhibition displaying the indigenous culture of Australia is being presented. Titled, Indigenous Australia: Masterworks from the National Gallery of Australia, it is a curtain raiser to Australia Fest Fest, that will bring Australian culture and creativity to India in September. The time line for art in this show spans late 1800s to present day. The exhibition includes works by the Torres Strait Islander artists who are indigenous people of the Torres Strait Islands, part of Queensland in Australia. The Wandjina we are talking about is by artist Alec Mingelmanganu from 1980. It’s distinctive from the others as it doesn’t have eyes. The empty sockets are separated by a sharp, narrow nose. The halo at the back is indicative of the work’s strong spiritual leanings. There are 102 mixed media artworks in this show. Many seem like simplistic renditions of what people experienced back in the day, but the message behind them is profound. One such being Cultivation of Whiteness, where artist Yhonnie Scarce uses glass sculptures in the shape of egg plants to point how aboriginals have been long used as guinea pigs for experimentation during Australia’s colonisation. It was in the second half of twentieth century that Australian aboriginal art began to get its due. Symbolisms held great importance as there was no written language. Dots and crosshatching became a principal style of this art. Despite any formal training, the native artists had a process of illustrating and expressing. They represented family and ancestral beliefs, much like India regional artists, but there were other personal experiences that came out through their drawings many times. Meeting the White Man caught our attention almost immediately. 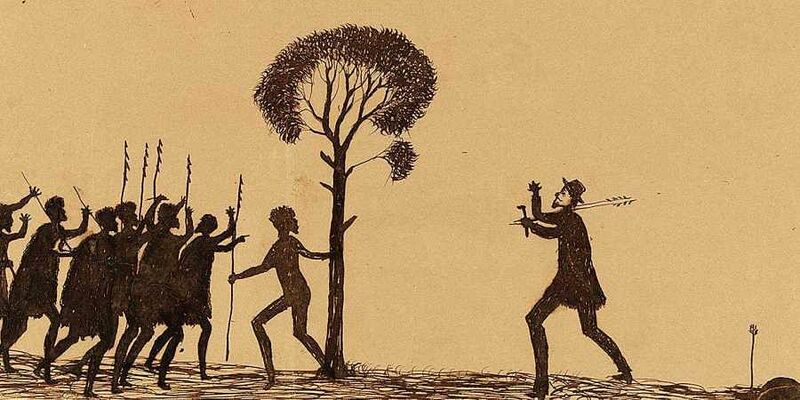 The artist Tommy McRae, who is an aboriginal himself, has drawn the fear born out of racisms in the way a white man seems to be walking with force in the direction of brown people. In Fiona Foley’s HHH (Hedonistic Honky Haters) too, the idea of racism and violence comes straight through. It draws a parallel to Ku Klux Klan (KKK), the three secret movements in USA that wanted to establish white supremacy. By using the word honky in her artwork, a Afro-American slang for a white person, she has gotten back in revolt to their discrimination. The deep emphatic plea for commiseration is palpable through the works. The wrong-doings, loss of autonomy, tragedies and injustice that aboriginals faced have been highlighted. They were displayed from their land, separated from their children and marginalised. Racism tore every bit of existence apart and mocked in the face of human dignity. Here are some of their heart-wrenching, yet powerfully astounding stories. Till August 26: From 11 am to 6.30 pm, at National Gallery of Modern Art near India Gate.